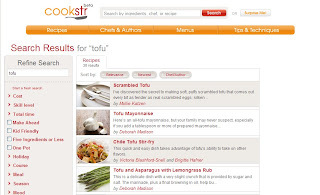 Cookstr is a cooking site that offers thousands of recipes. You can search, check different recipes, ingredients, chef. This is a new site, two other subjects menus and tips are still waiting for finish, but the interface is clean, easy to find recipes that you wanted. I tried search a rare recipe "Tofu", it displays about 30 items. With different recipes that is not too bad. You can use different filters to search subject, such as cost, skill level, holiday, and so on. It is very clear, that is what I liked. I do like cooking, and I like watch food channel on TV, if I found an interesting food I will search it online. Hope I can find some good recipes on Cookstr.